Satellite imagery has revealed two unusually large artillery pieces, measuring about 80 ft and 110 ft respectively, at a test centre for armour and artillery northwest of Baotou in China. The two pieces, which are horizontally mounted, are mounted on a concrete pad that appeared between September 2010 and December 2011, when the two pieces were first captured by satellite imagery. Images provided by Astrium confirmed that the objects were still in place in July 2013. 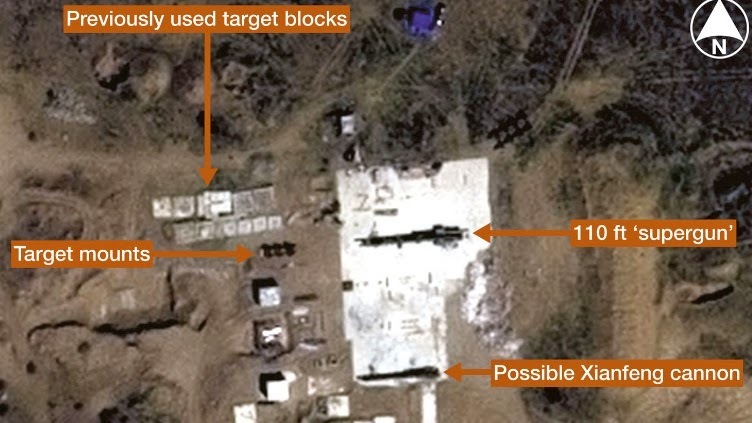 The 2011 imagery clearly depicts a series of what appear to be targets in front of the 110 ft piece, suggesting some kind of penetration testing for high-velocity projectiles. My Comment: These satellite images are a surprise .... but I am not going to read too much into it. Their anti-satellite and missile programs are more worrisome than this.